While prototyping a custom DMS asset handler today I managed to locate actual instructions on configuring your own QuickLink handlers for specific assets. However confusing it may be that these instructions were found in the “Users Manual”, I am just glad I was able to locate it fairly quickly. WARNING! This procedure is only necessary if Link Management is set to false in your web.config file. If if Link Management is set to true, Ektron CMS400.NET automatically updates the template within the quicklink when content is moved. See your system administrator for help with the web.config file. NOTE This action can only be performed on quicklinks. When content is moved in Ektron CMS400.NET, its quicklink does not get changed. After it is moved, you need to update the default template called in the content’s quicklink. To update the default template for one or more quicklinks, follow these steps. In the library, access the quicklinks folder containing quicklinks you want to update. Click the Update Quicklinks button. The Update URL Link Template Quicklinks screen is displayed. Check the quicklinks you want to update. NOTE Check the box in the table header to select or deselect all. Click the Update Quicklinks button to update the changes. A confirmation message is displayed. Click OK to continue. The selected quicklinks are updated to use the specified template. After roughly a month-and-a-half of planning, coordination, and a few stressful days and nights, the Miss Spectacular 2008 competition went off without a hitch. Created to celebrate the thirtieth birthday of my beloved wife, Nicole, it serves as a reminder that nothing, and I mean NOTHING is to risque, taboo, or off-color for our rather crazy group of friends. The pageant contestants were from all across the globe. A rather trashy filly from Costa Rica. A sweet and innocent beauty from Australia. A reserved and unrecognizable something from Afghanistan. A rather tempting “sister” from Texas. And last but not least, the blond German tank. Today, while reading an article on GameSpy.com, I ran across a cool widget for the AddThis bookmarking service. I had seen it a few months ago but had forgotten about it. It is a great interaction enhancement for an embedded cross site web feature (EXSWF). Yesterday at lunch, Nicole and I were fortunate enough to have witnessed our sweet daughter/princess, Brianne, stand up on her dining ‘bench’, turn around, lift up her church dress/skirt and commence wagging her behind at us chanting/singing ‘it’s my pineapple underpants…pineapple underpants’ repeatedly. The positive effects of the Disney Channel and Goofy on the minds of our youth. My children, are from another world. It’s official, Google and Salesforce.com have joined forces to offer enterprise CRM services coupled with Google’s ever so impressive Google Apps services. The possibilities are endless. Over the weekend, I cooked one of our family favorites, breakfast burritos, for our Sunday morning, sluff/slough church, breakfast. I will usually scramble up 8 – 9 eggs, cook some sort breakfast sausage, throw on some shredded Mexican cheese blend, spread a little salsa, and lay it all on a fresh cooked tortilla. So according to MrBreakfast.com’s article on cooking the ‘Perfect Scrambled Eggs’, using whipping cream was NOT on the list of things not to use. Now how was I supposed to know?! Suffice it to say, I’ll not be using whipping cream (at least out of a can) for my scrambled eggs in the future. I think I’ll give powdered milk a go around first. It reminds me of the time I blended up some of Nicole’s famous tortilla soup with my remaining fake crab in bulk from Costco while she was pregnant a few years ago. Probably not the same effect with her, but still, a learning experience in the kitchen. So I was sitting in a meeting here at work when the standard Apple update screen popped up. Good thing I actually read what the update was this time. 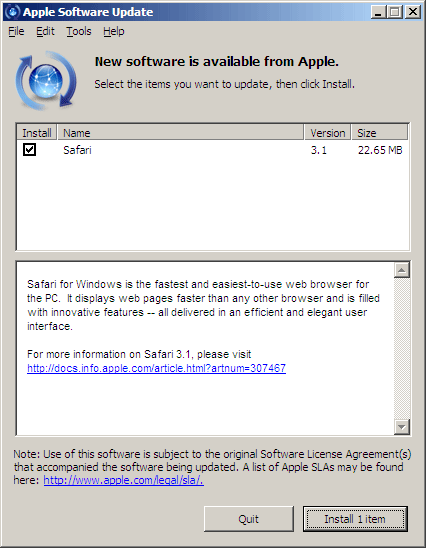 It appears Applesoft is trying to push their Safari web browser on me through QuickTime updates! Give me a break!!!. The Apple community has been so critical of Microsoft, now I can understand how the hypocritical bigotry has no bounds with these guys.